Some weeks back, I received a coupon in my e-mail from Total Wine & More. OK, I get coupons from them all the time, usually $5 off $50 or some similar offer. But once in a while the coupon is special; $10 off $50. That’s 20%! If you are a regular reader (thank you), you know that I tend to hover in the $12-18 range for my wine purchases. So when I get these coupons, I like to use them to expand beyond my normal range, and look for a pricier bottle in the $35-45 range. Then I’ll find something new and interesting to round out the order to get me over the $50 requirement. On this particular occasion, I needed a bottle in the $8-10 range to check out with the coupon. As I browsed the selections, I spotted something I’d never seen before: a red wine from Romania. Transylvania, no less! I immediately knew I had to try it. I checked with my friendly TW&M store associate, who I’ve gotten to know and trust, and she gave the wine two thumbs-up. Into the basket, and away we went! From what I’ve read about this heretofore unknown (to me) grape, it is best served with smoked or grilled meat. Alas, shortly after procuring the bottle, I found myself temporarily without a grill. So it rested. Now, several weeks later, I have remedied the dilemma and have resumed my meat-charring ways. The time was right to open and taste this exotic and mysterious juice! 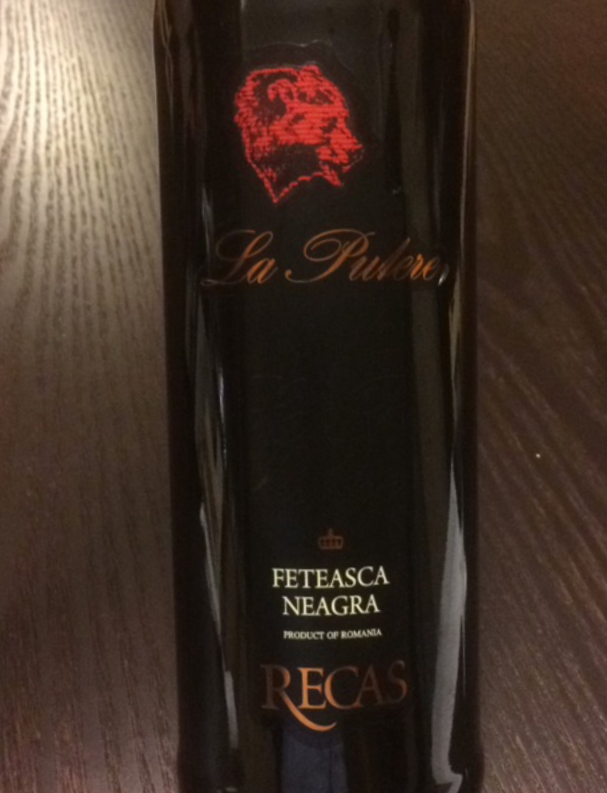 According to the Wine-Searcher website, Feteasca Neagra means “black maiden.” The grape is native to Moldova, but suffered during the Soviet era, and is now more widely planted in Romania. It is often used as a blending grape with Cabernet Sauvignon and Merlot. Well, let’s crack that screwcap and see if I go batty for it! Dracula’s wine? My first from Transylvania! Though I was expecting blood red, I was greeted with a pale garnet color in the glass, with aromas of raspberry and strawberry with a bit of baking spice. On the palate, bold red fruit: raspberry, plum, and strawberry with super soft tannins and light, balanced acidity. As it opens up, leather and tobacco swoop in. Medium body, with complexity throughout, leading to a ripe berry and chocolate-cherry finish. 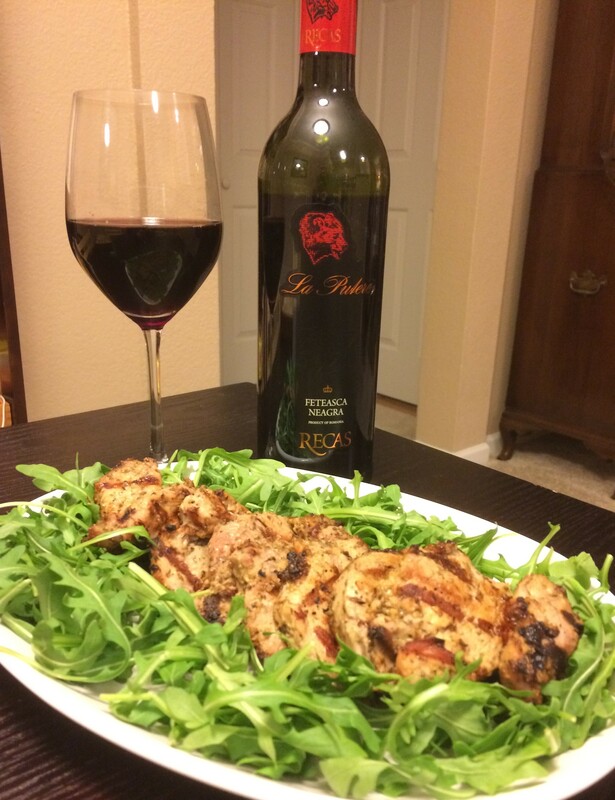 I don’t know if Vlad the Impaler liked his meat roasted, but paired with Grilled Pork Tenderloin in a simple Olive Oil-Dijon marinade, this wine was out of this world! A great value that I’ll definitely buy again. If you have tried, or decide to try this wine, please let me know how you liked it!